It was a really fun afternoon, but I don’t always want to be finishing seventh. 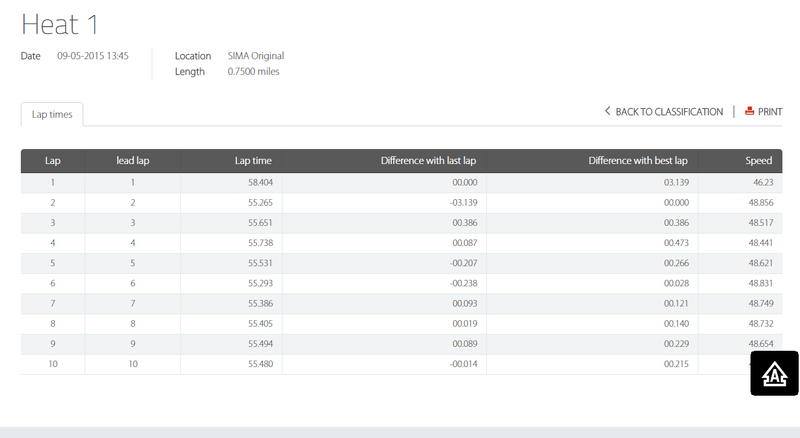 Below you can see the lap times from one of the heat races. The difference between the laps were pretty consistent, once I got into a rhythm. Now, I’ve only been driving TAG Senior for a bit over a month. I know that a good portion of the lap time I need to find is due to understanding my setup. However, a larger part of it has been down to myself as the driver, getting more comfortable with extracting more performance out of my kart. Ironically since moving from four-stroke, it’s really not the increase in horsepower that’s the challenge, it’s properly slowing down using the brakes. If you’ve been following the blog, you probably already knew a bit of that background. 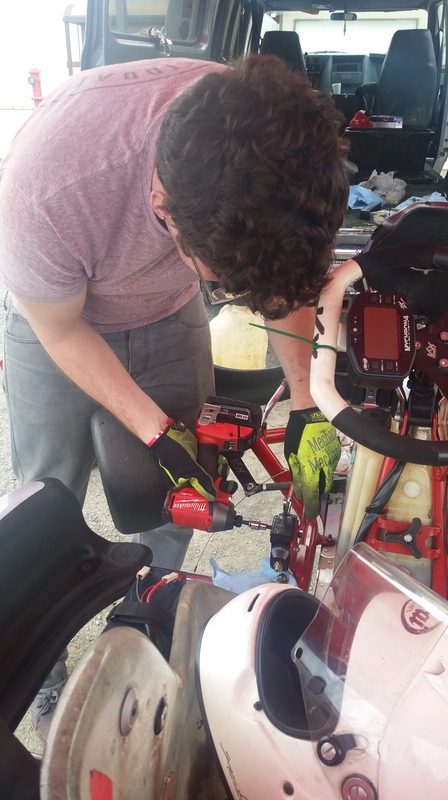 You’d also know that Chris Novotney has been helping me work on my kart setup. He’s also been invaluable as a spotter, giving me reference points of where I’m doing well, and also what needs improvement. Honestly, I wouldn’t be able to be making such improvements without Chris. First, he’s super dependable and always makes it to practices. Second, because he gives instant feedback from a trackside perspective that I just can’t see while I’m driving. Finally, he’s asking the right questions about how the kart should work, which makes both of us do more research on how we can find more laptime. One of the key things that we’ve been working on is has been doing a better job at keeping notes of the changes that we make. That way, every practice day we can start right back off where we left off the last time. Today, we were back at the track working through some setup changes that we wanted to try. I tested through three different sets of wheels, a few different tire pressure run settings and some rear hub changes just to start get the handling more consistent. I spent the entire day focusing on two things. Trying to brake at that cone, and smoothly lining up this curb. I probably got it right 10% of the time. 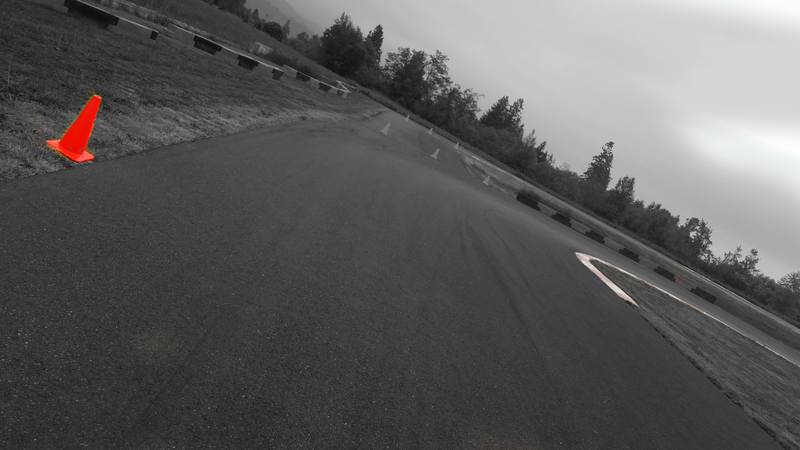 On the driving front, I was grateful to have one of the instructors help me by placing a cone on the track, trying to get me to move my braking zone deeper into the corner, so I can start getting used to it. To be honest, I probably only got it right once out of every ten times today. Deep down, I know that the kart can make the corner, it’s just a matter of me getting comfortable accelerating past where I think I should be slowing down, and then getting on the brakes hard. When I did get it right, it started to click, but I just need more laps to really understand how to do it with control. Since I started karting, I’ve been aware how capable the braking performance could be. Today, I got a small sense of how strong a weapon that being a skilled braker could really be in a battle. I’m pretty confident that a good amount of the lap time that I’m looking to find in the races are just improving how I use the brakes, and then how I manage to chase the throttle. It’s really down to driver confidence, more than anything. I just need to work on driving deep into the corner, and getting on the brakes hard. I’ve also been taught that I need to improve the rate on which I get on the brakes, and how quickly I get off the throttle when I start to brake. I tend to overlap the two. I went back and started to watch some of my onboard video from my last few practice days, Below, you can see an example on how not to do it. I did some research when I got home, and found another write up from Terrence Dove, which explained the technique in more detail. So it’s something that I definitely am putting my attention on improving now. The aim should be to not hear the motor when I’m on the brakes. As I’m releasing my foot off the throttle too slowly, I’m effectively dragging the throttle into the corner making the brake zone longer. I got a hint of it, yesterday. So next week, I’ll be back up at SIMA for another practice. Working on that braking zone, getting used nearly being sideways locked up and probably hating that cone. Now that I’ve got an exercise to work on, the next thing we need to do is try to get that damned AIM Mychron GPS working! Edit: I found a video of Scott Hargrove, which has him braking the way that I should be doing it. Leaving it up here for reference. Watch when under braking, it sounds like the motor nearly shut off. He’s solely braking, rather than dragging any throttle. This entry was posted in Karting, Race Projects and tagged Brakes, braking, karting, SIMA, [TAGTeam]. Bookmark the permalink.